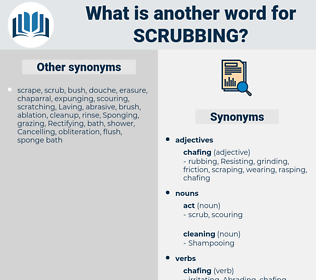 What is another word for scrubbing? 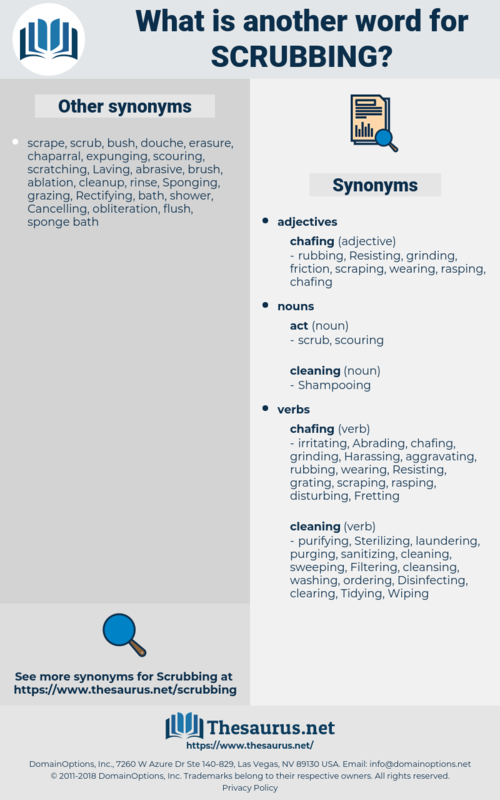 debugging, cleansing, laundering, purification, wash, debug, scrubber, lavage, sewage. squeezing, sanitizing, clearing, purifying, picking, part, Treating, vetting, purging, debugging, cleaning, cleansing. The room behind, though perhaps not free from a little perfume of the cheese and bacon which occupied the back part of the shop, was pleasant enough; it had a broad lattice window, looking over the pleasant fields, under which stood Lizzie's work - table, a large white wooden one, very clean and old, with signs of long scrubbing and the progress of time, scattered over with the little litter of dressmaking.
" I wonder when these things was washed afore," said the woman, scrubbing at them. sucker punch, surfing, surviving, swerving, serpens, scrubbiness, surveying, scraping, scrappiness, sharpness, 's Gravenhage, serving.